One of my great interests is reading books from the early 1900s that describe the troubles in higher education and the means by which people thought to eliminate problems and improve processes. 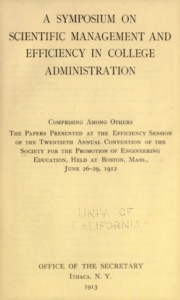 The period 1910-1915 saw a lot of interest in applying the then-new Scientific Management to process problems in teaching and administration in higher education. The first thing to realize is that Frederick Winslow Taylor and his colleagues who created Scientific management are not the evil-minded people you may have been led to believe (for example, see “The Spirit and Social Significance of Scientific Management,” 1913). They, as others who were interested in Scientific Management, were intelligent, deeply thoughtful people, with good intentions, dedicated to improving American higher education for the benefit of students and to make professors’ job easier. Bias against Taylor or Scientific management will limit your ability to comprehend the work of those who sought ways to apply in an effort to improve higher education in the early 1900s – for the benefit of both students and faculty. The book, A Symposium on Scientific Management and Efficiency in College Administration, is an interesting look back at how academics and non-academics described the problems in higher ed teaching and administration and reasoned how progressive Scientific Management, the forerunner, to Lean management, could help. Remarkably, the problems then are mostly the same as now. The focus of the book is engineering education, though you will find much useful information for any academic discipline. The latter chapters focus on the plight of the professor and their many burdens, and how to relive the faculty of burdens so that they can focus on doing what they are paid to do. Read the chapters by Frederick A. Parkhurst, Henry L. Gantt, and H.K. Hathaway to better understand Scientific Management. But if your time and level of interest are limited, skip to the chapters by W.A. Hillebrand, Hugo Diemer, William Kent, H. Wade Hibbard, George Shepard (very good chapter), S. Edgar Whitaker (another very good chapter) to understand the problems in higher education and how Scientific Management was seen as a good and practical solution.